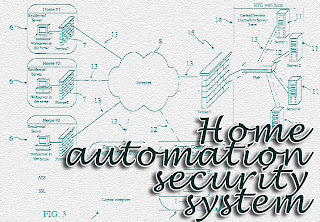 Home automation security project (complete paper) ~ Engineering projects ideas for final year students & paper presentations collection blog. Title: Home automation security system project. Department: Computer science, Automation, Networking, Communication. Can be used for: To improve ideas in automation projects, develop home security projects and research papers, paper presentations. This engineering project is an patent by Thomas J. Hackman et al. This paper will provide you with the details of the titled project. The topic of automation and security is in top notch in the research field. For those students who are interested in this topic "Automation projects" this paper will be very useful. To explain this paper in simple words, the projects is developed for home and office purposes. A computer network controlled and monitored automation system in which a residential server controls and monitors security and other computer controllable systems in the same house/office. Sample of this paper presentation / engineering project: A network overview of a current industry standard for Web control of a home automation system. Such prior-art home automation systems place a Web server in each of the homes that remote users can directly connect to outside of the home, such as, for example, via a laptop while traveling or via a PC while at work. To access the user's home automation system, the remote user simply 'surfs' directly to a Web server that is located in the home. This Web server is usually directly connected to the Internet and very exposed to hackers. For example, the data connections shown in FIG. 1 are all established via plain text HTTP requests (unencrypted). A primary disadvantage with this prior-art system is that a Web server directly connected to the Internet is often exposed to hackers. If proper precautions are taken, the risk to someone hacking into the home can be minimized but not eliminated. The home is an attractive target to hackers for many obvious reasons. The most common vulnerabilities to the systems that are sought after are flaws in the operating system, Web server or ancillary services. Operating system manufacturers are constantly releasing patches to repair recently discovered security flaws or to stop newly invented hacking tools. Corporations usually have someone on their IT staff actively monitoring their servers, installing all of the latest security patches, and reacting to stop intrusions. Homeowners, on the other hand, will unlikely have the technical background to perform this task, and a system initially intended to make their life easier should not place this type of burden upon them.